Practicing different buildings on flip chart paper. .
Mike Brennan shares experiences through art & design. Some of his work includes custom “Rockstar” pet portraits, pop culture art, yoga art, live event sketching, original paintings, and graphic design. He recently authored & illustrated the books Dear Snow: One Man’s Angry Rant Against Winter, The Art of Yoga, and Dear Human: What Your Dog is Really Thinking. 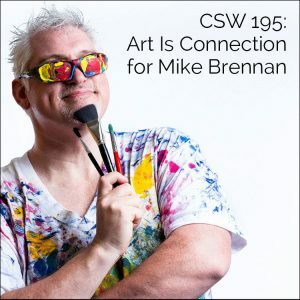 While the media and subject matter may vary, he creates art that shares experiences to form connections with his audience. His art has been featured on AMC’s Talking Dead, and the Syfy channel’s artist spotlight. In visual facilitation, simplicity and speed are key. Way more important than realism or aesthetics. “Learning to draw” means something different when your goal is to communicate concepts than when your goal is to express the glory of a landscape (or whatever). These dogs aren’t going to win any awards for artistic achievement, but that’s not what visual thinking is about. It’s about communication of ideas. So if my “star dogs” or “stick figure dogs” communicate the idea of “dog” or “dog-ness” to a viewer, they are a 💯% success! 😊 After being mired in the perfectionist paralysis swamp of the art world for so long, there’s something really liberating about that. .
Silly critter knot doodles on a Sunday morning. Hope you’re having a great weekend! My previous post showed sketches in my journal, as I worked out how to draw some of the icons on a smaller scale. Then I did a few rough passes at a layout—also in my journal—and then I did some practice passes at the wall, on flip chart paper, with my Neuland markers. Since I’ll be using this drawing as part of a series of posts over on LinkedIn, and a wider, longer shape works better there, I decided to futz with it a bit in Photoshop, to end up with a 1200×628 pixel dimension graphic. How do you learn to draw? The same way you learn to do anything else: practice! Applied effort over time. Here’s a peek at my journal, where today I was working out how to draw a director’s chair, with help from The Noun Project (if you don’t know of this fantastic resource yet, check it out at http://bit.ly/2Vj5o2z). What muscles are you wanting to develop? What steps are you committing to take to get yourself there? Teeny-tiny critter knot doodles. Happy Monday! Happy April Fools Day! Go play! After 3 days at a @groveconsultants graphic facilitation workshop with the fabulous @malgosiakostecka, I am inspired and motivated to practice with my #neulandmarkers every day! Lettering, drawing, listening, layout—*something*. Even just a minute at a flip chart is better than nothing! And there’s never a shortage of things to improve on. Arrows and boxes are hard, for example (straight lines and symmetry: NOT my strong suits!) But these faces are so fun to draw! They’re just a U, an L or w for a nose, and dots or upside-down u’s for eyes, c’s for ears, add a neck, mouth, and some squiggles for hair, and voilá! A happy person! 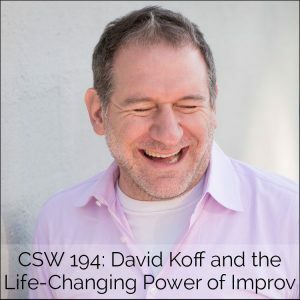 David Koff’s been on or around the stage for over 40 years as an actor, producer, director, and teacher. He’s appeared on the TV shows “The West Wing” and on “Sesame Street”, something nearly impossible to pull off. After over 20 years of professional acting in Los Angeles, David and his wife moved to Portland, Oregon where he’s performed and taught improvisation at Curious Comedy, The Brody Theater and now, to the students of the St. Andrew Nativity Jesuit school. He and his wife Mary are expecting their first child in November.